In search for a stand-out, cool looking wrist watch? Ziiiro's line of watches is anything but conventional. Ziiiro is a fairly new company, and compared to the well known giants, Ziiiro's unique design concept for its watches is like a small ecstasy pill with a smiley face on it. So if manly thrusting watches like Tissot's PRS 516 don't tickle your fancy, let Ziiiro sort you out with one of its eye-grabbing watches. The Celeste is the company's latest analog watch with a watch face so uncommon, it's a mind-bender to interpret at first glance. But first, you will have to part with $205 from your pile of cash in order to get yourself one. After that, you might like to know that the Celeste is made entirely out of stainless steel, so it's pretty hefty for its fragile-looking size. The way you tell time is by looking at the two transparent plastic discs that overlap one another, each with a gradient that causes a multitude of awesome looking gradient color tones. Of course, there are no numbers to be found, instead you'll have to look at the subtle corresponding notches made in the Celeste's stainless steel casing which are positioned accurately where otherwise a digit or numeral would be on any other analog watch. In this model there are blue and gray colored discs with a white base. The gray one tells you the hour while the blue indicated minutes. Look for the distinct ending line on each of the two gradient discs, and you've got the exact time. That dual-colored watch face is easier to read than you might initially think. It might look difficult at first, but once you understand the fundamentals of the Celeste's time displaying concept it'll be as easy as reading any other mute watch. The two transparent discs cycle around in a never-ending time cycle creating some amazing color patterns along the way. 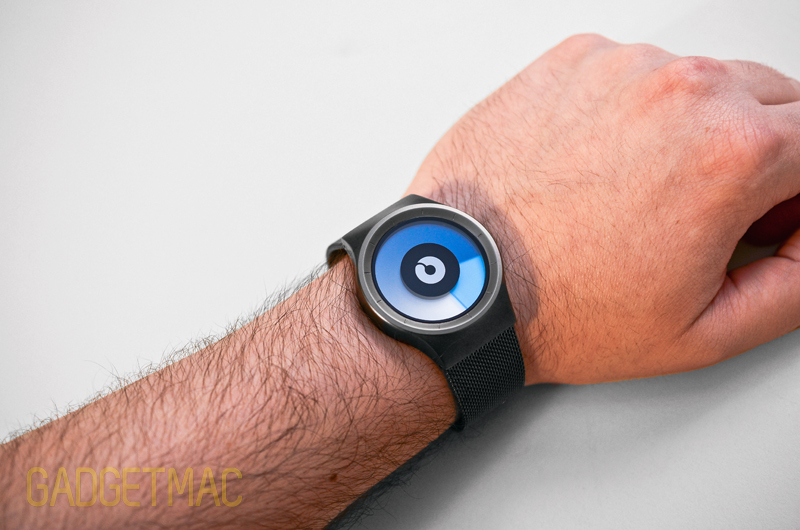 This unique gradient swirling watch face design is what makes Ziiiro watches so different from all the rest. Ziiiro's choice of color for its watches compliments both the dial face and the outer watch body in a beautiful array full of vibrant contrast. The Celeste comes in this distinct Mono flavor which features the blue and gray color scheme, and in a Colored flavor featuring a yellow and blue color scheme that results in color blending of yellowish lime green with gradients of blue. The Celeste has a petit, uber clean unisex style with a small 40mm case diameter that'll suit women more nicely than it would men. Although if you're not a bulky fellow, then the Celeste would suit you handsomely. The design of the Celeste keeps things at a minimalist stance, with a clean and smooth matte finished stainless steel casing. The build quality is really high for what you're paying. And don't think because you've likely not heard about the brand will mean that this watch has wonky qualities, quite the opposite. The Celeste exhibits careful attention to detail. Things like the delicate stainless steel mesh strap which feels very comfortable against the skin, give the Celeste a gentle touch of elegance and uniqueness. While it may seem like a chain mill strap more than anything, it's the smoothest most forgiving chain mill you'll come across. It feels very much like the delicate skin of a gecko lizard. Best of all, the mesh strap doesn't pull on wrist hairs nor does it feel sharp against the edges. Unlike removable links found on just about every watch with a metal strap which require special link-removal tools and time in order to custom fit your wrist, adjusting the Celeste's mesh strap is literally a cinch and you'll be able to do it yourself right out of the box. 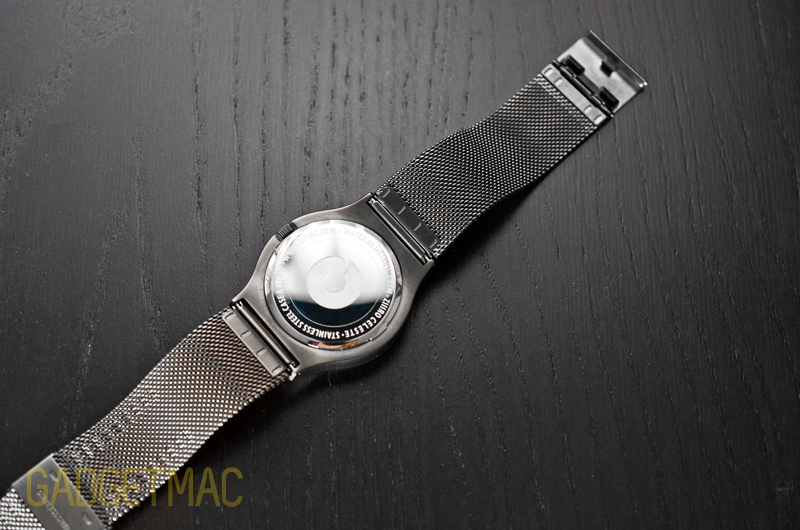 The underside of the mesh strap has specified levels of notches to help you guide the metal clasp to adjust the length of the strap to fit your wrist. Securing the Celeste is done using its metal clasp which snaps close and can be opened and closed very easily using just one finger. Keeping things as minimal and as clean as can be, you'll find a screw crown on the side of the casing for adjusting the time on the Celeste. It's also worth mentioning that the Celeste is water-resistant for up to just 32 feet. The Japanese quartz watch module makes no ticking noise nor does it visually seem like it's moving or ticking around time since there is no second hand present. Our biggest complaint about the Celeste is that it has no luminescent face or some type of backlighting so there's absolutely no way of telling time in the dark. And that's a shame because with that incredible fusion of blending colors, the Celeste would have looked awesome if it were to have some form of a lighting feature. That said, none of Ziiiro's analog watches have a form of backlighting. However, Ziiiro just recently released its first digital wrist watch called the Saturn, and it's got full backlighting with the same Celeste-type matte stainless steel body design, albeit without the eye-catching color. So if that's something important to you in a watch, you might want to take a look at the Saturn model instead. 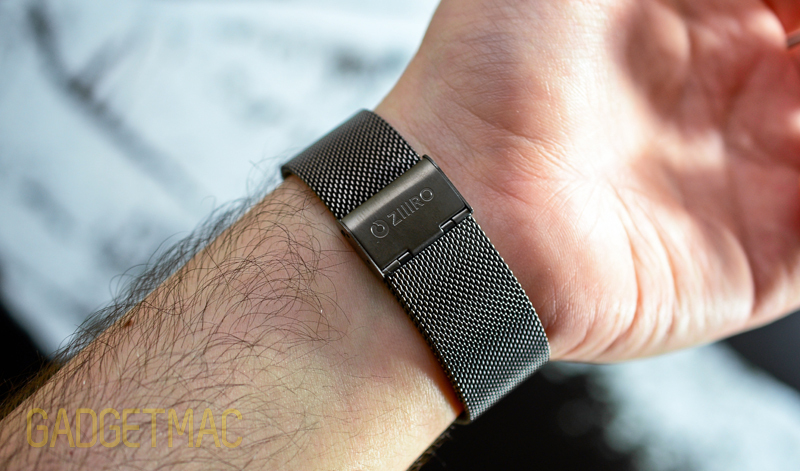 Another caveat is that there is no date feature to any of the Ziiiro watches. Ziiiro's Celeste comes inside a protective round clear packaging that's as unique as the watch itself. You'll also find a simple to understand user manual that'll show you how to use the Celeste's swirl time face, how to adjust the time and mesh strap with detailed graphics. The Ziiiro Celeste is one of the simplest, most modern watches we've come across. It may not be as useful as others, but it sure is a unique stylish timepiece with a design so intriguing it belongs on the set of a blockbuster sci-fi movie. One things for sure, you can color us impressed!